Whether it’s pickles or tomatoes, anything slimy or anything red, many children experience “pickiness”. Pickiness can certainly be very frustrating for parents and caregivers, and can result in some complicated meal planning (especially when a child’s food preferences sometimes seem to change at the drop of a hat), but pickiness is actually very common in young children, as evidenced by the number of picture books on the subject! 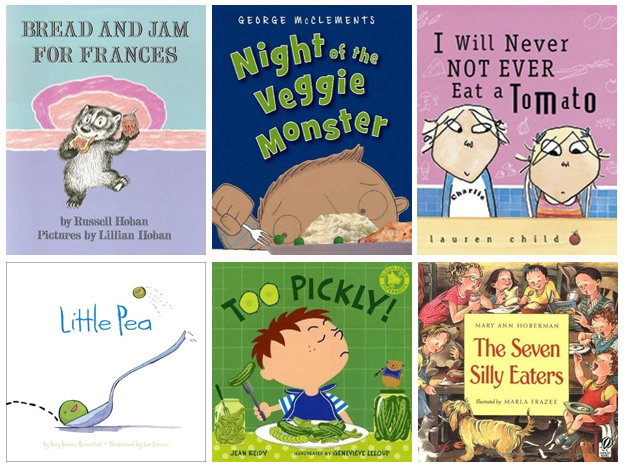 These six picture books feature some very picky eaters, and while they might not convince your little one to finally give lima beans a try, they’ll hopefully at least bring a smile to your face! It’s lunchtime, but this picky eater finds a reason to pass on just about everything in this short, fun, colourful picture book that more than a few readers will be able to relate with. Charlie’s little sister Lola has a list of foods she will never not ever eat, but Charlie has a few tricks up his sleeve to turn this picky eater into an adventurous nosher! Frances only wants to eat one thing – bread and jam. Bread and jam for breakfast, bread and jam for lunch, bread and jam for dinner. Eventually, though, Frances comes to realize that too much of a good thing might just be a bad thing after all! A young veggie hater engages in an epic battle of “war and peas” against everything green in this silly story filled with striking mixed-media illustrations. What’s a mother to do when all of her children are the pickiest of picky eaters?! This lighthearted romp features a clever mother who figures out just how to keep all of her silly eaters happy. Every child knows the familiar refrain “You can’t have dessert until you’ve eaten your dinner.” But what about when you’re a pea? Little Pea has to eat ALL his candy before he can have a few special bites of vegetables. Amusing and filled with bright and fun illustrations, this entire series is a winner. Jane Whittingham is a librarian, author and book blogger. You can find her online at www.raincitylibrarian.ca. Her debut picture book, Wild One, was published by Pajama Press in 2017.